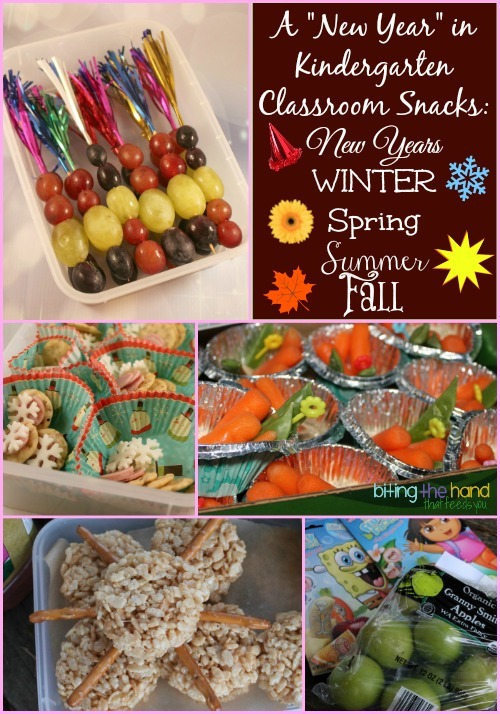 The first week back at school after the Winter break was my turn as snack mom at Z's morning Kindergarten class. I decided to bring in the new year with a bang! 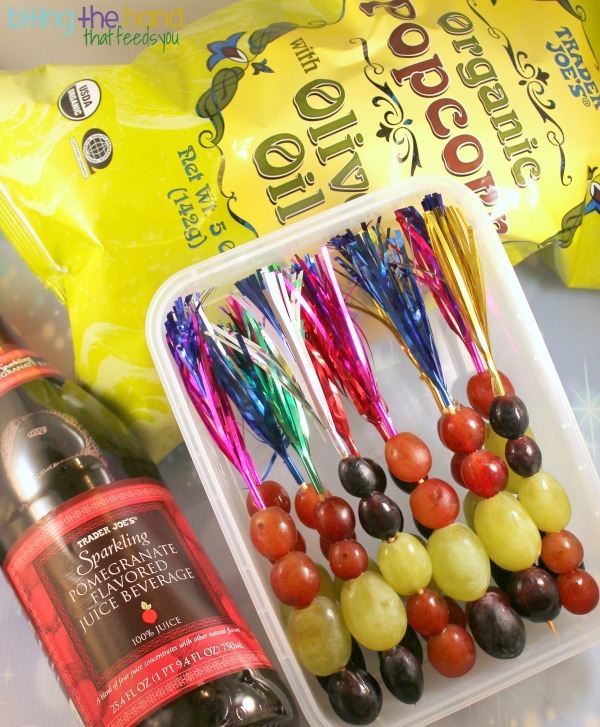 Monday, 1/6/14 - For a New Years-themed snack, I put green, red, and black grapes on some tinsel party skewers. Like fireworks! To go with them, I sent some popcorn and sparkling pomegranate juice. Party time! For a winter snack, I did mini Lunchables-style cracker-stackers with snowflake shapes. I used a tiny circle cutter on some uncured ham and a mini snowflake fondant cutter on sliced goat cheese, and sent them with some mini savory crackers from Trader Joe's. Since I was ready to jab an ice pick into my brain after cutting just 36 hams and cheeses (3 per student,) I sent a bag of sweet potato chips to fill them up. 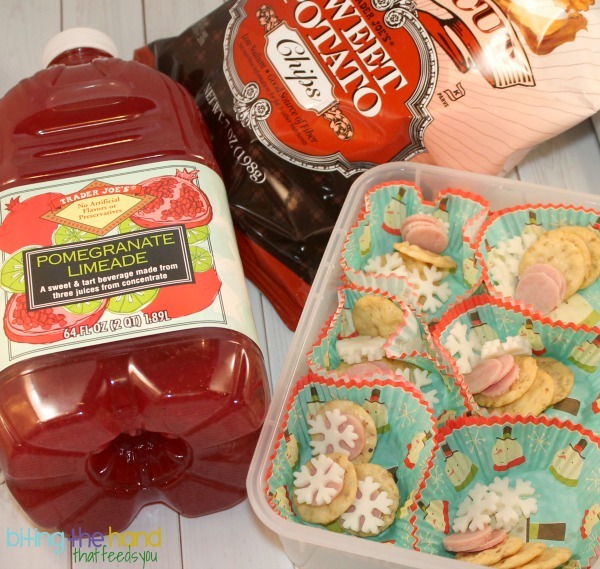 And Z looooooves Trader Joe's Pomegranate Limeaid, so I made sure to get some for her week as "Snack Helper." Because pomegranates and sweet potatoes are seasonal in the winter! Wednesday, 1/8/14 - For a "Spring" theme, I made a bouquet of veggies! 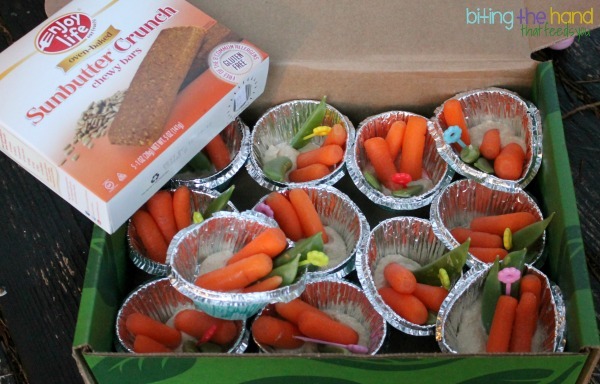 I put a little hummus in the bottom of some fancy baking cups (they have a green flowery print on the outsides) and "planted" some organic sugar snap peas and carrots. To make it more garden-y, I put a mini flower pick in each one. And since it starts getting sunny in the Spring, I also sent some Enjoy Life Sunbutter Crunch bars. I didn't send a drink because the juice jugs last two days if the teacher puts it in the fridge overnight. Which she does. I love this teacher! Thursday, 1/9/14 - What's more summery than a build-your-own sun? Well. I hadn't intended them to be build-your-own. 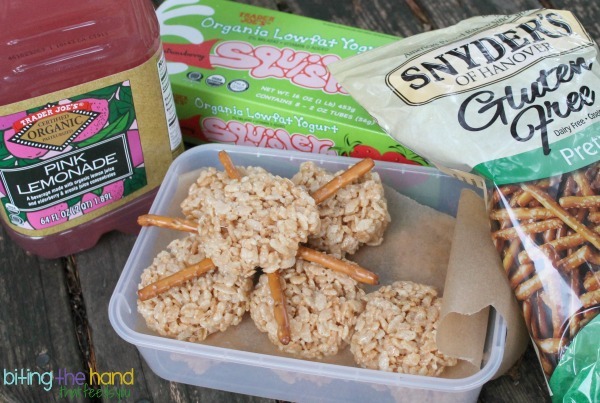 But the stupid gluten-free Snyder's pretzel sticks wouldn't stay in the rice crispy treat patties I made. For the rice crispy treats, I used Erewhon crispy brown rice cereal because they're gluten-free (the Trader Joe's brand isn't) and free of petrochemicals (Rice Krispies has a petroleum-derived preservative.) I made them with Dandies vegan marshmallows (one of the two brands I've ever found without artificial Blue 1 food dye) and dairy-free Earth Balance organic buttery spread (I'm intolerant to dairy) using this rice crispy treats recipe. I had several "Fall" ideas, including making leaf-shaped tortilla chips and cinnamon pumpkin seed butter. But the teacher had forgotten the yogurt tubes in the fridge the day before, so I didn't want to pile on too much extra food. 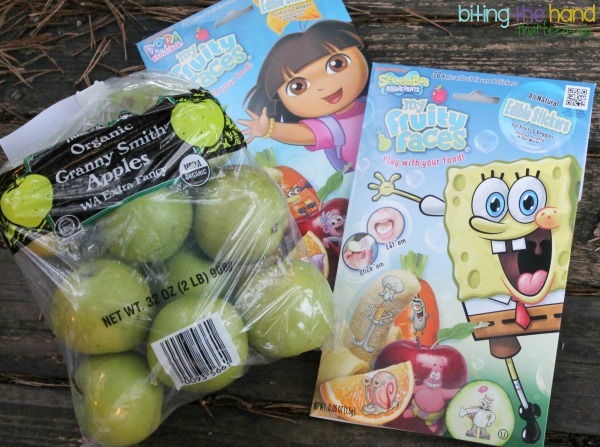 In the end I went for "It's the end of the week - I'm exhausted" easy and lazy apples with My Fruity Faces edible food stickers - Dora and Spongebob versions. They come in little packets, so the kids could each get multiple stickers with no extra effort on my part. Win!